Looks like we could be gaining a lot of steam here. 4* Benhart getting CB’s and visiting this weekend. 4* Danielsen visiting this weekend unofficially. 4* Concoran visiting this weekend unofficially. Next weekend, the Twin Towers From Texas in the 2021 class are visiting. Both 4*. Foster & Conner. Would be fun to land a couple of these guys. Been saying it for years...we need to rebuild the lines..it all starts up front. You’re right. I overlooked it while we were getting the skill guys. You’re right. I overlooked it while we were getting the skill guys to visit. As to the subject, I still believe we have the physical talent to play much better than we are. There still needs to be a rebuild of the line. Players need to be with these coaches for longer than they have been to see the improvement we want. That very well could need to be the new recruits coming in. We aren't going to be able to just rely on development either. They are going to need to find some OL that can compete to start as a true freshman because they are that good. Good luck with that philosophy. There is probably about 10 to 15 true Frosh OL that are physically ready to play at a high P5 level and those guys are going to Bama and other powerhouse schools. So for now it is getting good solid frames with good athleticism and developing OL in our program is probably the route to go. JUCO could be a route that they look at for another interior player for next year. Bland will be very good inside. You haven't followed the history of NU linemen over the past 40 years - have you? This isn't the good ol days anymore is it? Yes - we have started one true freshman ever at OL, Tyler Moore, and the dude was a total wuss who transferred. Funoti started on the OL as a true freshman. He was 2 time all conference and was a 2nd round draft pick. Funoti started on the﻿ OL as a true freshman. He was 2 time all conference and was a 2nd round draft pick. Alright, party pooper, I'll be more specific. SPH said we need to recruit kids who can compete to start Day 1. 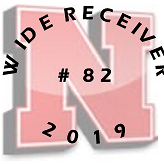 The Huskers have had one true freshman ever start Day 1 - Tyler Moore, and he was a total wuss who transferred. We need O linemen who develop into animals as upper classmen so that we don't need true freshmen to come in and start. If you are starting a true freshman on the O line, you have major issues. Does it count that Jaimes started 9 games as a true freshman last year and was arguably one of the best on the field? For the record, I didn't say they HAD to start. I said compete to start. Wisconsin (who many say we are trying to be like) had 3 RS Freshmen on their 2 deep last year. That likely wasn't out of desperation. It was because they were ready to play. 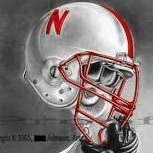 Lately, freshmen starting for Nebraska on the OL, has been due more because of lack of depth and we needed a body. Basically we need good OL that can actually push the players that are on the team. It doesn't need to be all 5 freshmen starting. I would just like to see 1-2 big time OL be able to come in and actually compete day 1. Even if they still redshirt in the end. It is also because when you have 17 offensive linemen on the team and 9 of them are freshmen, you literally have to have some freshmen in the two-deep. alright, I will be very clear. Only. One. Player. Ever. Has. Ever. Started. A. Season. Opener. At. OL. For. Nebraska. Okay. Fair enough. Can we agree we need to get OL here that can at least PUSH for playing time as freshmen? They don't have to start. Just be good enough to play? Or are we only going for 2-3 year developmental players? The bold is how it works 99.9% of the time and this in not saying that they are recruiting developmental players - it's just that 18 year old lineman need lots of development. We've only had one lineman ever start a season opener?? Do we just use extra tight ends on the first series?? Not sure about how many True Freshmen are playing. Nicholas Petit Frere and Jackson Carman are two of the top OL in last class and they are not starting. Those guy are about as ready as any 18 year old can get, but they are playing at OSU and Clemson so competition is quite a bit higher. I could see more RSFr playing but that is not bringing guys to play right away. I think the guys we are bringing in could look to make an impact after a RS year. I think if you look at the number of true sophomores that are starting or 2nd string, there are a lot. Which means they played as true freshmen. I'm just looking for us to not always bring in "projects." Our OL is middle of the pack at best and if we don't get players in that can push them, I don't think they will get much better. Just need new players that will push the older ones early. You are not understanding the "Culture" it is just the opposite the older ones are the ones that push the younger ones to climb up to their level so that they are studs for their Jr/Sr years. Patience for what? The starting 5 OL as a unit are not very good. They are average at best. And the OL coach says they can only rely on ONE backup. This isn't just me talking. The radio guys are saying the same thing. Where are the other guys to step up? 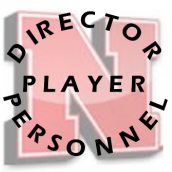 my lord you act as if the coaching staff nebraska has in place has been recruiting to nebraska for years. This team hasn't had a very good OL for many years. It's not just these coaches. exactly. in one year they cant do what the previous 3 coaches couldnt do in 14 years. while it may not look like they are recruiting "the best lineman" by star standards they are recruiting to a system. 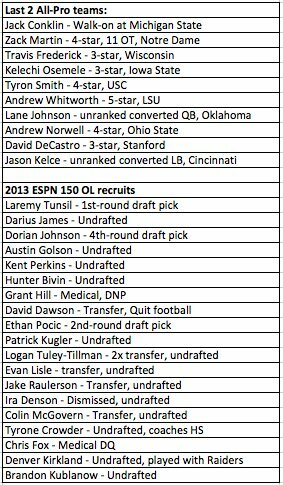 so we have to have a little patience and see what the line looks like when they have players recruited to their system. Stars aren't the issue. Ability is. We have 3 4-star OL starting and they aren't very good as a unit. i am gonna scratch my head and move on from this thread because you just ignored everything i and others have said. but before i leave, this staff has brought in the best OL they could get last year on a short cycle. they have recruits in this year's class that fit their system but may not be day 1 starters and are also still recruiting a couple of OL that could push for pt right away. lastly, nothing the recruits can do this year to help the OL. The best they could get was ONE CENTER that was already committed? Kinda cool, looks pretty solid for all of these guys sans Danielsen. The twin towers are visiting N again in a couple weeks. Hoping we just load up in the trenches. I get the feeling that getting Benhart really changed our outlook on OL recruiting for this class. First, we seemed to pretty much lose interest in taking a JUCO OT. Which is still a bit surprising to me but we seem to have moved on from that. Word is Anderson has been slated to start out at LT. Which would mean that Benhart would presumably be working at RT. The best explanation for that would be Jaimes has the LT spot locked down for the next two years so Anderson has time to mature and get stronger. But I would think that would give Benhart every chance to come in and start from Day 1. Assuming he can catch/surpass MFarniok early enough, that would let Farniok slide inside where he is probably a better fit anyway. Second, word is Michael Lynn is actually going to start out on the interior. I can't say for sure that getting Benhart changed the thinking about him but it's possible. The two classes ahead of him are light on guards so we'll have to fill in somewhere. Third, it also might have given the coaches some latitude to not be all that worried about Bland. Not saying they wouldn't still want him as I still think he could definitely help next year. But it might have given them some freedom to not really have to worry as much about him not making it. Mostly speculation there on my part but it fits the pieces to the puzzle. Finally, it gives us the opportunity to take a chance on a guy like Fritzche who is a bit of a project. We wouldn't need someone to be ready to go for a couple years so you have some time to develop a guy who has some potential. I'm guessing we see an OLine similar to this next year. The center position is going to be interesting to watch. I would not be surprised to see Raridon move back to center. Speaking of Jurgens, I've seen comments around the interwebs that there were some pictures of him and you can see he's put on a lot of good weight and "looks like an offensive lineman" now. Has anyone seen him lately?